Public safety personnel hit South Bay streets Saturday to give back to the communities they serve. Eager children lined up and waited patiently to climb aboard firetrucks in Sunnyvale as part the decades-long "Rides-for-Toys" holiday tradition. The annual event allows youngsters to ride along with public safety members in exchange for donating a holiday gift that will eventually be handed over to other youngsters in need. Marie Bernard, the Executive Director at Sunnyvale Community Services, said that the event is a perfect way to spread holiday cheer. "It's just very heartwarming. We just had some folks donate a lot of toys to us and we said 'Thank you.' They said they were thankful because several years ago, they needed our help when they couldn't pay there rent. Because of that, they're back on their feet. They're going to give back now." 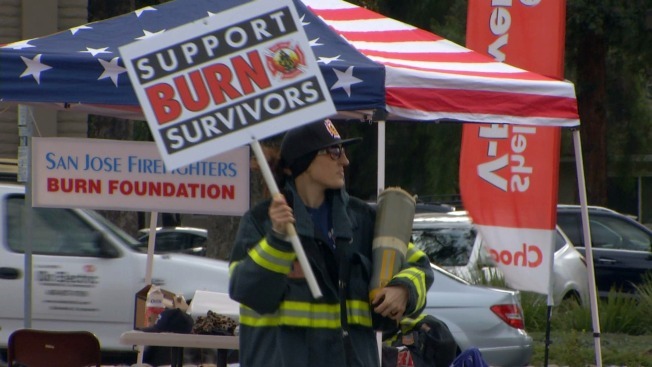 Just a few miles away in San Jose, firefighters populated a busy intersection clutching money-filled boots and signs as part of the annual "Fill-the-Boot" campaign, an initiative designed to raise money for burn victims at Santa Clara Valley Medical Center. Jill Sproul, Nurse Manager for the Burn Center at Santa Clara Valley Medical Center, said the San Jose Firefighter Burn Foundation was working extra hard this go around to raise funds for new burn garments. Sproul added that the public certainly helped accomplish that goal. "They are so giving," she said. "People reaching into their pockets and filling the boot. It's always heartwarming to see how generous this community is."